Good afternoon, we are from the Filipino Immigrants and Workers Organizing Project or FIWOP. We are an organization for Filipino immigrants and workers based in Jersey City, NJ. We aim to educate, organize and mobilize Filipino immigrant workers for the advancement of their rights and welfare. Today, we stand with our fellow workers in demanding that the minimum wage be raised to $15 now. We call on our fellow workers to join in this growing movement to assert our rights as workers, regardless of immigration status. Currently, there are more than 100,000 Filipinos in New Jersey. 33% belongs to the working class concentrated in the factories, restaurants, warehouses, nursing homes and other service industries. Like many other workers, Filipino immigrant workers face various issues and problems in the community or at the workplace. We suffer from wage theft, lack of decent pay and work benefits and deskilling. But as immigrants, we also suffer family separation due to unjust immigration policy, discrimination and unfair treatment. 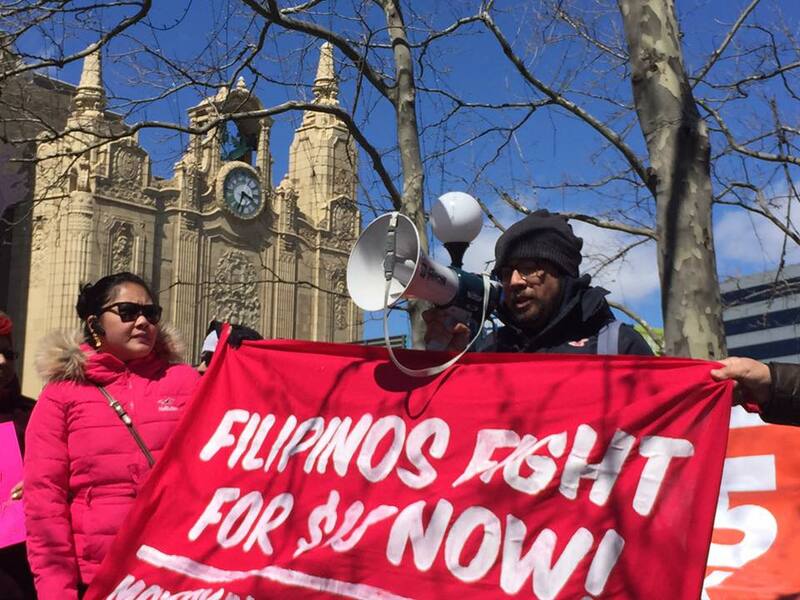 We are here in New Jersey because we are forced to migrate from exploitative working conditions back home in the Philippines – lack of jobs, if there are jobs, they offer super low wages and no job security. We need $15 minimum wage now because our rent and cost of living keeps on increasing. These are the reasons why we need to stand together and fight to improve our living conditions. Our task now is to organize ourselves. Organize our fellow workers to break the fear and join the fight. We must educate ourselves on the roots of our poverty and exploitation. And lastly, we must link ourselves with the youth, the students, and other sectors of the community to build a powerful movement. Let us continue to fight for $15 now because when we fight, we win! Makibaka! Huwag matakot!